Media and Contents: 180mm X 250mm soft cover with 80 pages, 49 period black and white photos, 12 colour art-works including two on the cover. Advantages: Interesting subject, well written with good photos and artwork. 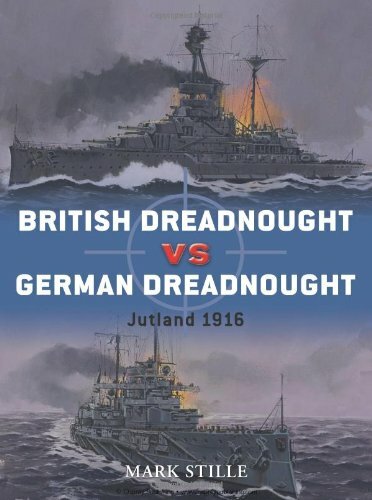 Conclusion: There have been many books written on British and German Dreadnoughts of WW I and the Battle of Jutland but this one is a comparison between the two up to the end of that conflict. There have been many books that cover this subject and many of them are in Osprey's own vast range, but this one is specifically a comparison between the British and German Dreadnoughts from HMS Dreadnought itself, up to the final surrender and scuttling of the German High Seas Fleet at Scapa Flow. Along the way, is covers the major fleet action, Jutland and discusses the out-come for both sides and why. After a brief introduction that includes a sub-heading of Naval Strategy in 1914, there is a two page timeline from the launch of Dreadnought to the beginning of the Battle of Jutland and then hour by hour for the battle. Next is Design and Development, first of the British side, why Dreadnought gave the Royal Navy an advantage of only 1 and subsequent classes and then the German ships and how they compared and why. This chapter also covers Firepower, Fire Control, Protection and Propulsion, the four elements which make a Battleship. The Strategic Situation. This chapter explains the situation between the British and German fleets up to Jutland with each wanting battle with the other but only on their own terms and includes the Battle of Dogger Bank, the so called near miss. Technical Specifications. This covers each of the British and German classes of Battleship with the differences or improvements from the class before. It does not mention the Battlecruisers from either side as they are covered in a similar book to this by Osprey. The Combatants. Beginning with the Royal Navy Dreadnought Crews, this chapter looks at the conditions and training of British Battleship crews as compared to German Battleship Crews and in the middle is a special section dealing with the careers and experience of the four Admirals, Admiral Sir John Jellicoe and Vice Admiral Sir David Beatty of the Royal Navy and Vice Admirals Reinhard Scheer and Franz Hipper of Germany. Combat. This is, of coarse, The Battle of Jutland known on the German side as the Skagerrak Battle. A sub-heading of British and German Tactics begins the chapter followed by First Contact and then The Battlecruiser Phase. Following on, The Battlelines Engage, The Second Engagement and The High Seas Fleet Breaks Through. These sub-sections cover the different phases of the battle and are accompanied by many period B&W photos, art-works and maps. Statistics and Analysis looks at what went wrong or right for both sides and includes many charts showing losses on either side, amount of shell fired by each ship compared to the amounts of hits by and on each ship. Why the British lost three Battlecruisers while the Germans only lost one and which of the Admirals performed well and who didn't. The final chapter is headed the Aftermath and details both fleets still trying to bring the other to battle but only on their own terms until mutinies broke out in the High Seas Fleet and the Armistice saw most of it interned at Scapa Flow where it was scuttled by its own crews. These Osprey Duel Series books are very interesting, giving the reader an insight into how the Navies and their ships compared and why the results from various battles were obtained. There are quite a few similar books in Ospreys library and are well worth a look.